So...it's come to my attention that we need to talk about vinyl...all types of vinyl. I do have a whole section on the blog about vinyl...but I've had some questions recently about what the best time of vinyl is for this or that project. And honestly it depends on a few different factors including how the vinyl will be used, where it will be used, and even your personal preferences. 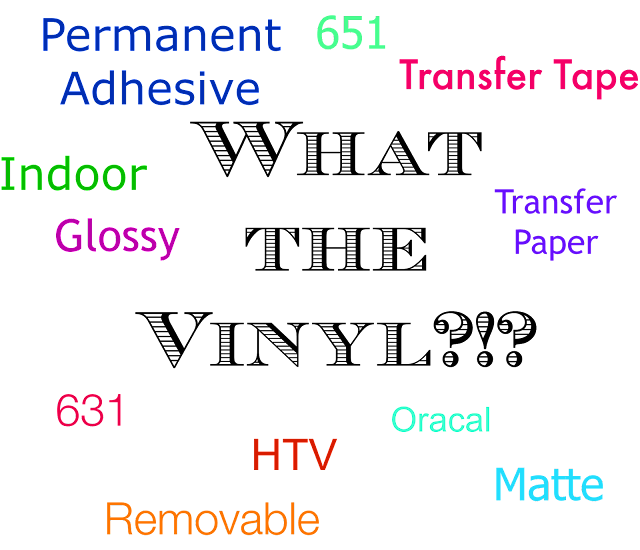 Indoor adhesive vinyl is the same as removable is the same as Oracal 631 is the same as matte vinyl*. Just different ways of saying the same thing. It's most often used for vinyl wall decals and indoor signs that won't be exposed to the elements or too much handling. Outdoor adhesive vinyl is the same as permanent vinyl is the same as Oracal 651 is the same as glossy. Outdoor vinyl isn't just for outdoors, despite it's oft-referred to name. I use it for pretty much everything besides indoor signs and wall decals. That includes dishes/outdoor projects like mailboxes, outdoor signs, jewelry...etc. *Oracal 651 does come in two matte colors: black and white. Oracal 631 and Oracal 651 are the industry standard and what I would suggest for ease of use, a wide selection of colors, and various sheet and roll size options. 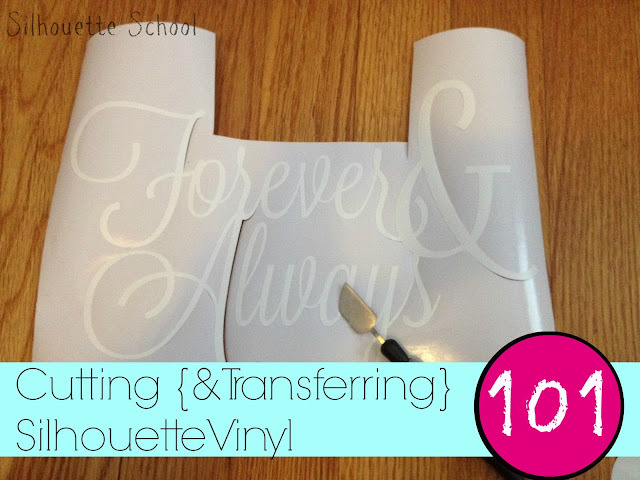 Here's a great beginner Silhouette CAMEO vinyl tutorial if you're new to vinyl! Transfer tape and transfer paper are used to move an adhesive vinyl decal from the vinyl backing to the surface where it needs to be applied. The transfer material sticks to the front side of the vinyl lifting it off the vinyl backing so it can be applied. Transfer tape is clear and non gridded and comes in a roll without any type of backing. It's easy to see through which makes applying the vinyl relatively easy. Transfer paper has more of a sticky paper feel and can be gridded to "help" with alignment. The grid lines only work if you apply the transfer paper exactly evenly which I rarely seem to be able to do. Transfer paper has a backing which needs to be removed before the transfer paper can be used to pick up and transfer the vinyl. Contact paper - found in the Dollar Store or other discount stores - also be used as a method to transfer vinyl designs. It can also be used as a substitute stencil material. Heat Transfer Vinyl or HTV is vinyl that's applied to clothing and apparel with the use of heat - in the way of an iron or heat press. I suggest Siser Easyweed brand which can be found on Amazon, Swing Design, and many other vinyl and sign suppliers. 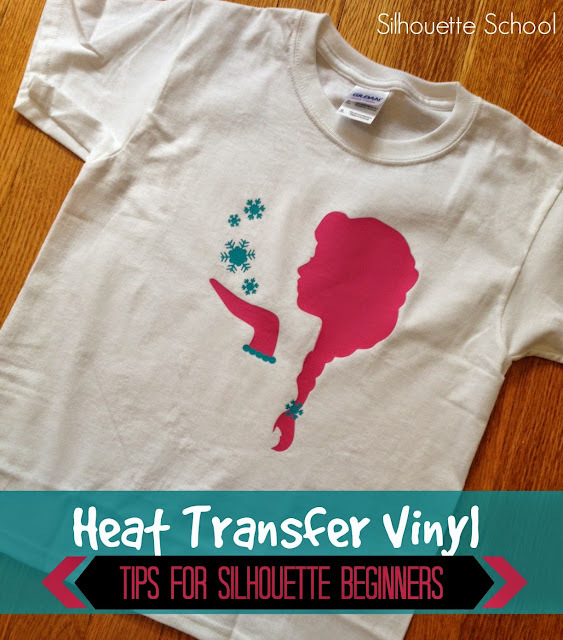 Check out this beginner Silhouette heat transfer vinyl tutorial! 1. I absolute love your blog! It has been so handy with learning what my Silhouette can do! Hi.. its been almost 2 months since you posted your question, but I thought I'd let you know that I've used Static Cling Vinyl for windows. I cut a design with regular vinyl and then apply that design to the static cling vinyl. I've used this method to make signs for my local church windows and also make fun window clings for my sons birthday party. The static cling vinyl does come in a few colors but if you want more color in your design just layer on regular vinyl. Hope this helps. Thanks to your blog I've finally worked up enough courage to work with vinyl. I just received my first order from Expressions Vinyl in the mail and I am so excited to get started. However, I ordered a grab bag (what a deal! ), and I'm at a bit of a loss. Some of the pieces were marked Oracal 631 and 651-no problem. I know what those are for. It's the unmarked pieces I don't know what to do with. Do you have any tips for telling the difference between types of vinyl? How do I know if they're permanent/indoor/outdoor/HTV just by looking at them and touching them. It's probably very obvious, but I am totally missing it. I don't want to waste any of my pieces! How would you apply heat to glass. Would it not break? Just curious as I am new to vinyl. Thanks! Hi. I love your blog. Been a big kearning curve for me. I am trying to make mugs with foil designs on. Can you give me any pointers pls. I have a sillhoutte portrait I have transfer paper and normal foils along w8th a mug press.